Just in case you feel like shopping here are the new great stuff from Oki-ni. If you love Julia Hederus’s amazing project with K-Swiss you will love more her main label Hederus. It’s a very edgy and raw collection. 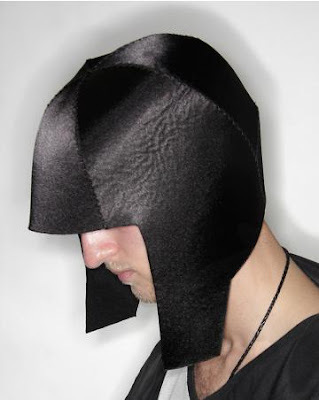 1) Hederus Mc Felt Helmet -Angular helmet hat made from felt and sating polyester. A flexible yet structured piece of headwear in five paneled fabric with two long ear flaps. Circumference of the inside of this hat measures 26” at its largest – comes in one size. 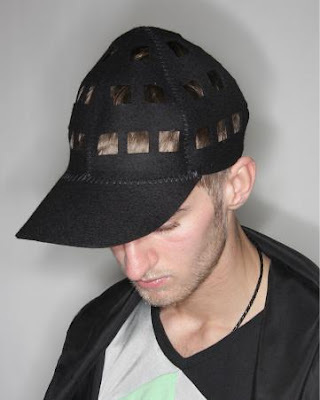 2) Hederus Square Cap -Black felt cap with latticed felt straps and dart shaped peak. Cap has an elasticated panel in the back which will allow it to adjust to the size of any wearer’s head. 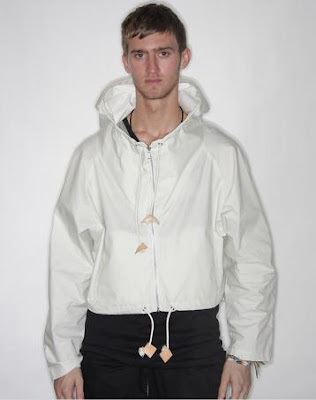 3) Hederus Kite Anorak -Cropped white polyester anorak with natural cord and suede drawstring fastenings at hood and hem. Jacket has an open round neck and is raglan cut with front zip and pointy back hem. 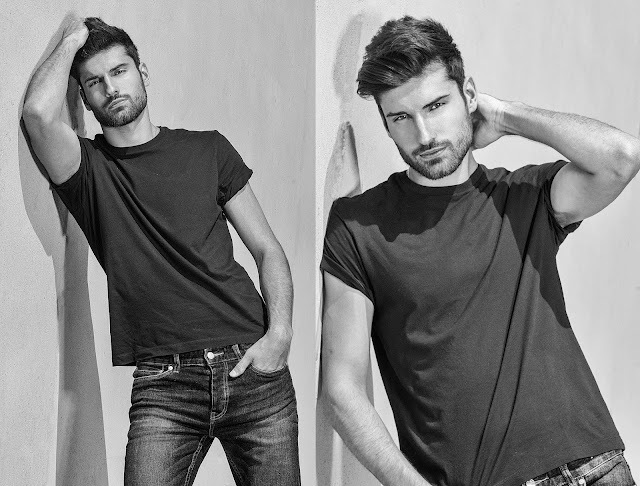 The fit’s casual, silhouette is loose and unstructured. 4) Hederus Tether Waistcoat -Sandwashed silk ‘tether’ scarf with straight cut arm openings. Green nylon thread in brass eyelets with leather patches in three of the four corners. This piece doesn’t fasten which emphasizes how loose and unstructured it is. 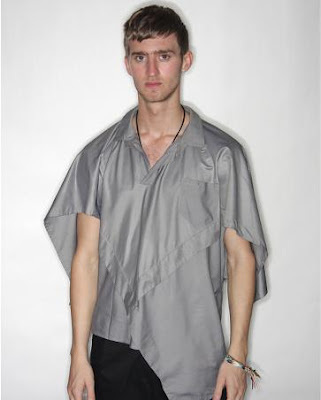 5) Hederus Kite Shirt - A light grey silk paneled top in triangular panesl. The collar fastens with a single button, the silhouette is loose and unstructured which means this piece fits and suits most body types. 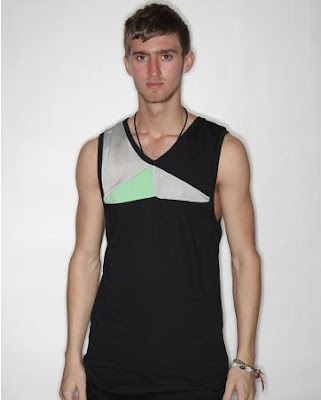 6) Hederus Kite Vest -Soft cotton black jersey ‘Kite’ vest with an unstructured hem, long arm holes and grey and green nylon jersey patchwork detailing at front and back. Collar and arm holes are ribbed. More of oki-ni 's Hederus collection here. Collection 9 explores the ideas of Utopias and uses the extremes of the Arctic wilderness to establish its setting. The a/w collection is a uniform for survival. Olive drap and khaki are crucial components of the collection; gray and black serve to accent these base colours and signify polar night. The sweaters in the collection are made of heavy spun wool and feature thick shawl collars and hoods designed to fight bitter temperatures. Wool plaid field shirts and pale grey, formal cotton oxfords add structure to the collection. 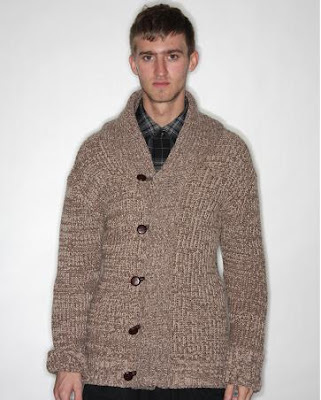 1) Nom De Guerre Shawl Collar Cardigan - Tawny coloured heavy knitted cardigan with brown leather button fastenings. This is a really simply constructed chunky cardigan. 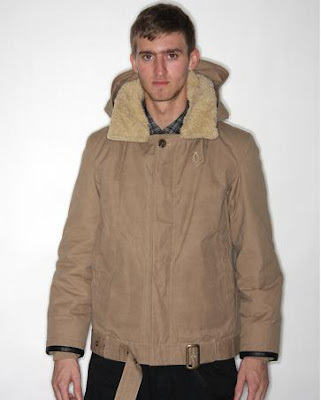 2) Nom De Guerre Canvas Jacket - Heavy duty sand belted parka with thick sheepskin effect lining. With a detachable drawstring hood, covered buttons, 2 outer pockets and a chunky utility belt this is a great coat for cold days. Cuffs are leather trimmed and can be button adjusted for tightness. 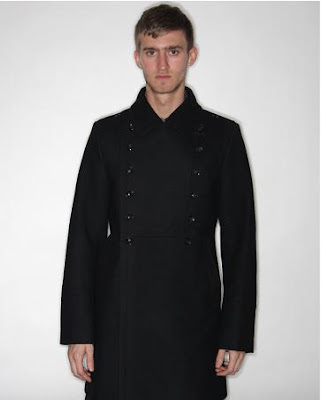 3) Nom De Guerre Great Coat -Double breasted heavy wool great coat with button detailing. Fully lined, this solid coat had back waist band, deep hip pockets and a soft large lapelled collar than can be worn up or down. 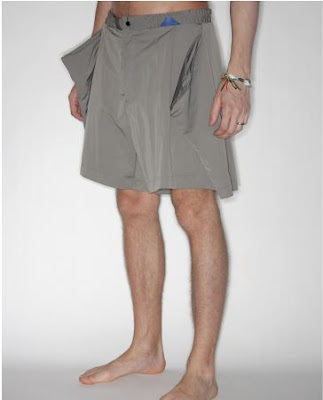 There’s one internal coin pocket and two tiny circular details on each shoulder. This coat looks as great worn open as it does fastened. 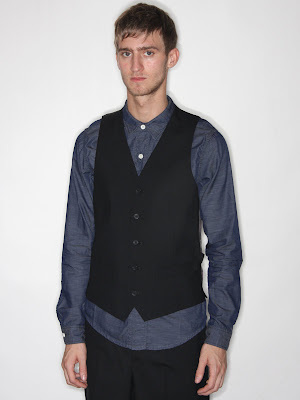 4) Nom De Guerre 2 Pocket Vest -2 pocket black single breasted waistcoat which fastens with 5 buttons. Neck is a mid-height v, body is darted for a typically slim Nom fit. 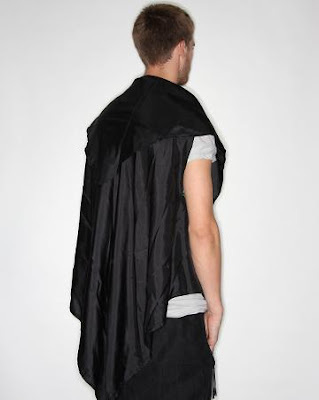 The back is paneled and has an adjustable belt for a streamlined silhouette. 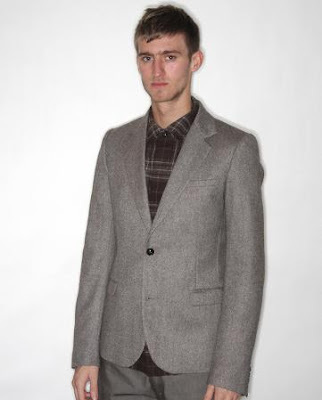 5) Nom De Guerre 2 Button Blazer -Simply constructed brown 2 button single breasted blazer with two flap hip pockets, one chest pocket and two inside pockets. Jacket is fully lined but still light, has a slim cut and back vent. More of oki-ni's Nom De Guerre collection here. For autumn/winter the collection looks forward to a contemporary, cutting edge approach to fit and fabrication. Silhouettes are sharp and colours and controlled. Tailoring references continue into knitwear with two new silhouettes: the high break cardigan and a polo neck in a pique knit. Outwear sticks to classics styles but fabric and styling details make classics ultra contemporary. 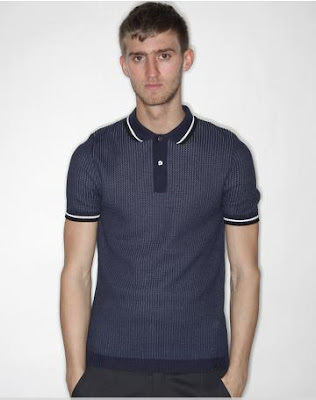 1) Fred Perry Twisted Texture Knitted Sports Shirt - Twisted texture knitted sports shirt in a soft navy waffle knit with contrasting ecru and black collar and sleeve trim. This shirt’s got an integrated ribbed hem (one of the key tailoring details of the season’s collection) and knitted 2 button placket. 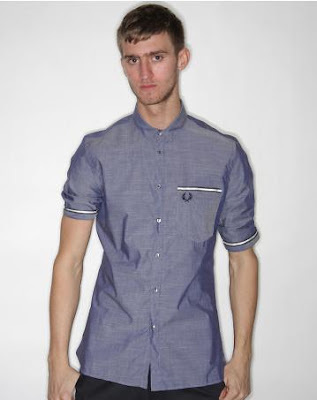 2) Fred Perry Selvedge End on End Shirt - Light denim chambray short sleeved shirt with white and navy selvage trim on cuffs, chest pocket and across the yoke. This shirt’s made of very lightweight chambray, has a small collar, exposed placket with laurel embossed buttons and a contrasting navy laurel. 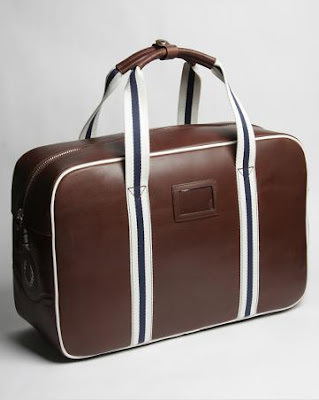 3) Fred Perry Leather Holdall - Dark chocolate leather holdall with contrasting white and navy canvas straps. Internally the bag’s split into two sections with a removable partition with a zipped pocket on one side and an open one on the other. There’s also a handy clear section for your name tag. 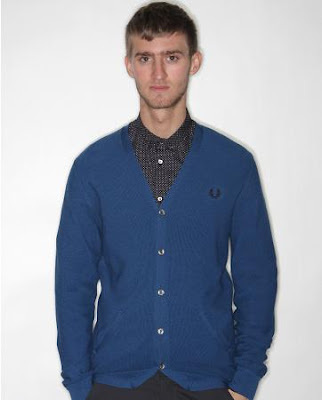 4) Fred Perry Tailored Pique Knit Sweater- Tailored pique knit cardigan in mid-blue with a contrasting black laurel and silver laurel embossed shell buttons. Sleeves fasten with shirt button detail and there are two intarsia elbow patches and two shallow hip pockets finished with matching ribbed knit. More of oki-ni's Fred Perry's collection here.